Few days ago Steve Goodman published new version of Get-ExchangeEnvironmentReport.ps1 script on his Blog. 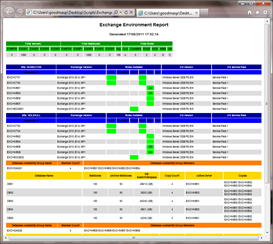 This script is really cool, and using it you can easly create report of your Mircosoft Exchange environment. New version supports Microsoft Exchange 2013 and fixes bugs reported by users. We think that every Exchange administrator should has this script. Tagged Get-ExchangeEnvironmentReport.ps1, Microsoft Exchange Report. Bookmark the permalink.